Click photos for detailed close ups! This week's Friday feature profiles Bay Area rocker and vintage replica builder Billy Rowe. That's why two separate guitars are pictured above. As a guitarist, Rowe helped found 80's band Jetboy which has recently re-formed after 19 years and is currently recording. After the original Jetboy run, Billy played 5 European tours with the band American Heartbreak. In the late 90's Billy was Chris Isaak's guitar tech and also worked on Isaac's "Speak of the Devil" album. In recent years, Rowe has been building heavily distressed F-type guitars under the Rock N' Roll Relics moniker. The black model in the top photo was built for Stevie D. of Buckcherry who will be playing this guitar soon on tour with Buckcherry opening for KISS. GNR's Gilby Clarke is also playing one of Billy's guitars. At www.rocknrollrelics.net be sure to visit the "Pickers" link at the menu and check out the spiffy color palette overlay tool. Also check the galleries. 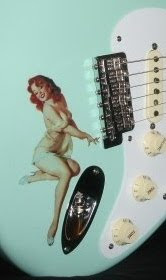 "...For all my Rock N' Roll Relics I use reissued Fender hardware, all bodies and necks are sprayed with nitro from Guitar Re-Ranch, the bodies I get hand cut from a local Luthier here in town. I've also used Guitar Mill bodies which are great. I use all Ash and Alder to match vintage specs unless a special request from a customer for say Pine or Mahogany. Necks I get from various sources like All Parts or I get my Luthier to cut them for me, Depends on what the customer is after. Most customers want the vintage profiles and what is the most popular is the standard 7-1/4 C shape neck from All Parts. With pickups I've used all sorts from Duncan, Fralin to Fender etc, I always leave that up to the customer. But now I have a guy who hand winds me pickups, Nunley Custom and they are hands down the best I've come across and is what I've used exclusively for about 10 builds now, I use em' myself as well ! I also use Luxe capacitors when I do a 'Period Piece' to give it that complete vintage look Inside and out ! Also for a 'period piece' guitars (mainly Tele's) I'll use Glendale milled jack cups and slot head screws..."
Billy has also recently used Slider's Vintage Classic pickups in projects. Ed note: I'm just diggin' that Converse sticker! What's more American than a well worn pair of black Chuck high-tops-- & a well worn black Strat. Ed update: Rock N Roll Relics are built to order. Contact Kelcey at customguitarboutique.com for details on procuring a Billy Rowe relic guitar that best fits your vintage concept. Tell Kelcey that Stratoblogster sent ya!